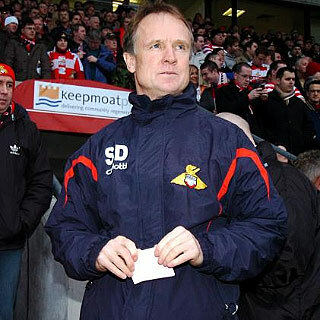 DONCASTER Rovers manager Sean O'Driscoll has admitted that he won't be having a drop of alcohol to celebrate his side's Wembley Play-Off Final victory over Leeds, as he doesn't think his players will be willing to sacrafice a drop as they part through the night at the team's hotel. "You can't stand still," said O'Driscoll speaking to BBC Sport after seeing his Doncaster side achieve an unbelievable fait. "As soon as the game ends you're thinking 'now I've got to try and improve the squad within the budget'. "We'll reflect on what we did well and what we can improve on because we go into a difficult division next season." Five years. Three promotions. From the Conference and the brink of an even lower birth of football to Coca-Cola Championship and in touching distance of the Premiership. It really is hard to take in, but Doncaster have done a fantastic job and have really done their town proud. The promotion will also see Donny compete in the Championship for the first time in over 50 years. Doncaster were easily the better side in the opening proceedings at Wembley, with Jason Price seeing his shot blocked, before a lively James Hayter was denied twice by Leeds 'keeper Kasper Ankergren who was easily Leeds' best player. But then just two minutes into the second period at Wembley and Hayter lost his man to leave room for a fantastic diving header from the penalty spot. But depsite the fantastic things he has achieved at Doncaster this season he is refusing to get carried away and insisted that he won't be having any champagne to celebrate: "No, I won't be having any champagne. When you've got 20-odd players with bottles of champagne I don't think they're going to give any to me. "They've worked hard all season, so we've left them to it and we'll wait for them to calm down before having a quiet word with them, which we do after every game." O'Driscoll singled out game winner Hayter for special praise as the pint sized striker popped up to score his first goal in four months in what was only his second start of 2008 following a string on injuries: "I'm blessed with forwards. I had three on the bench. James had a hernia operation and the fellow that came in did really well," he said. "It's just one of those things in football, but his attitude has been first class. He works extremely hard in training, doesn't moan, he just gets on with it and you can play him anywhere. "He has that football knowledge and takes responsibility, so I'm delighted for him." And after scoring his 11th goal of the season, former Bournemouth man, Hayter was clearly delighted with the victory: "I thought we were magnificent, I was just going out there to enjoy it, really. I'm just delighted to be playing and I just gave it my all and luckily it turned out I got the winner. It's just unbelievable."